Welcome to our UCAP Archives! Grab your favorite beverage, sit back, and enjoy the races from our perspective! All these extra races mean more work for me! You've heard of the movie "Escape from New York"? I call this UCAP "Escape from TMS"! If you've read my previous UCAPs, you may recall that my husband, Mark, works for The Richards Group, an advertising agency here in Dallas. Home Depot is one of the company's biggest clients, and as an audio engineer, Mark handles all of their radio commercials and some of their TV ads. Much to my surprise, in early March 2002, one of Mark's connections came through with Pit/Garage Passes. Mark thought Mom and I would enjoy the passes more than he would, so he was off to Lubbock to visit his nephew from San Francisco while Mom and I headed to the races. We tried to take lots of notes and I shot 27 rolls of film, so I hope we've captured the experience to your liking. Or what Barry Horn of the Dallas Morning news calls "The-Race-at-the-end-of-the-World's-Biggest-Traffic-Jam". No, we never did get those luxury suite passes, and yes, Mark did elect to stay home this year (his loss! ), so Mom and I found ourselves in the infield, cameras in hand, ready to take some GREAT photos for everyone. Maybe not so Up-Close-And-Personal as last year, but some neat stuff none-the-less. So sit back, relax, and enjoy our view from the Redneck Seats! 1999: Look out TMS, here we come! Have you ever wondered what Luxury Suite tickets looked like? We did, so here they are. 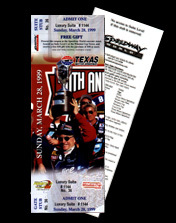 If you click on them, you can enter our 1999 Texas 500 site! Be patient, there's lots of photos on this site, so it may take a while to load! Don't forget our 1997 and 1998 Texas 500 Recaps!